Just like regular horse racing we have two options for racing - flat racing with our straight track or our oval steeplechase track complete with bits to jump over. Both the Steeplechase and flat track are for 2-4 participants at a time. 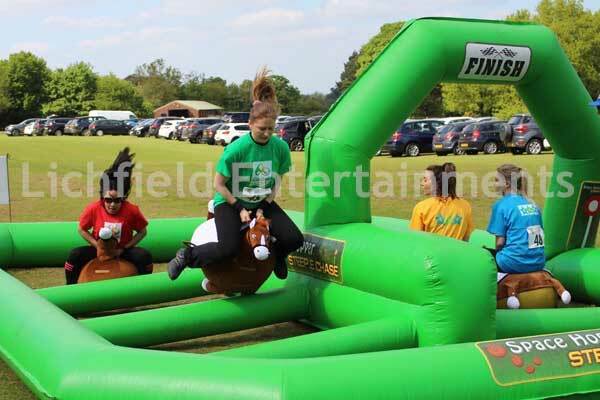 With the Steeplechase track participants have to bounce their way around the oval track as quickly as they can on their horse shaped hoppers jumping the obstacles as they go. On the flat track its a straight race from under the starting 'gates' to the finish line. Suitable for ages 7 to adult. The inflatable Steeplechase track requires an operating area of 25x20ft and the straight track needs 40x30ft. The hopper racing tracks can be supplied with our without staff. Petrol powered fan for where there is no electricity supply available at the venue. All weather flood lighting for use in the evening. 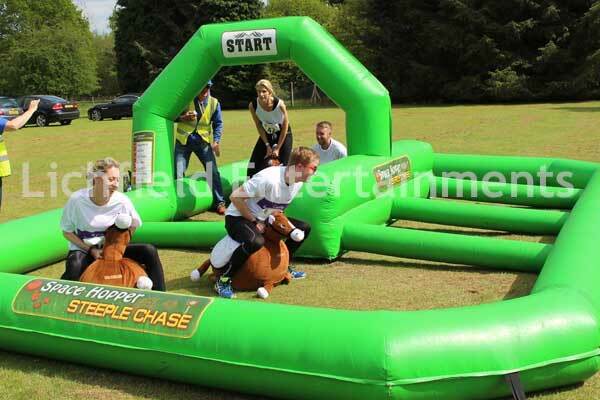 If you have any queries, questions, or would like to hire our inflatable horse racing game for your event please click here to enquire and we will do all we can to help.